(Nanowerk News) The National Nanotechnology Initiative today published the proceedings of a technical interchange meeting on “Realizing the Promise of Carbon Nanotubes: Challenges, Opportunities, and the Pathway to Commercialization” (pdf), held at the National Aeronautics and Space Administration (NASA) Headquarters on September 15, 2014. 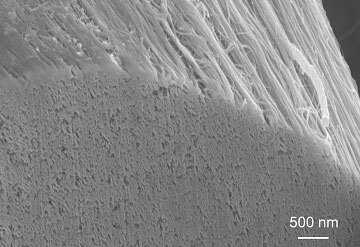 This meeting brought together some of the Nation’s leading experts in carbon nanotube materials to identify, discuss, and report on technical barriers to the production of carbon nanotube (CNT)-based bulk and composite materials with properties that more closely match those of individual CNTs and to explore ways to overcome these barriers. Increased efforts devoted to manufacturing, quality control, and scale-up. Improvements in the mechanical and electrical properties of CNT-based bulk materials to approach the properties of individual CNTs. More effective use of simulation and modeling to provide insight into the fundamentals of the CNT growth process. Improved understanding of the properties of bulk CNT-containing materials at longer length scales. Standard materials and protocols to guide the testing of CNT-based products for commercial applications. Life cycle assessments for gauging commercial readiness. Use of public-private partnerships or other collaboration vehicles to leverage resources and expertise to solve these technical challenges and accelerate commercialization. The outcomes of this meeting, as detailed in this report, will help inform the future directions of the NNI Nanotechnology Signature Initiative “Sustainable Nanomanufacturing: Creating the Industries of the Future”, which was launched in 2010 to accelerate the development of industrial-scale methods for manufacturing functional nanoscale systems.